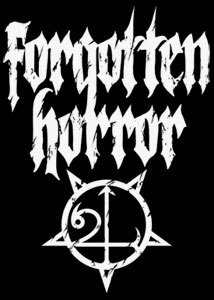 Forgotten Horror is spanish/finnish blackened thrashmetal band with members from deathchain. The band is formed in January 2004 by Kult(Tuomas Karhunen). The year 2004 is spent on composing songs and writing lyrics. The band is named "Forgotten Horror" in December 2004. 2005 was year of rehearsing, futile recordings without a line-up and of waiting for the right moment to strike. The recordings for the first demo started on 2006. The band headquarters are located in Madrid, Spain. Kassara (of Black Death Ritual, Darkwoods My Betrothed, Deathchain & Trollheim's Grott fame) joined the band as the drummer in December 2006. The drums for the first demo are re-recorded with Kassara on 2007. Corpse (of De Lirium's Order, Deathchain, Demilich & Trollheim's Grott fame) joined the band as the bass player in July 2007. The demo 2007 is released in August.